Laudetur Iesus Christus! 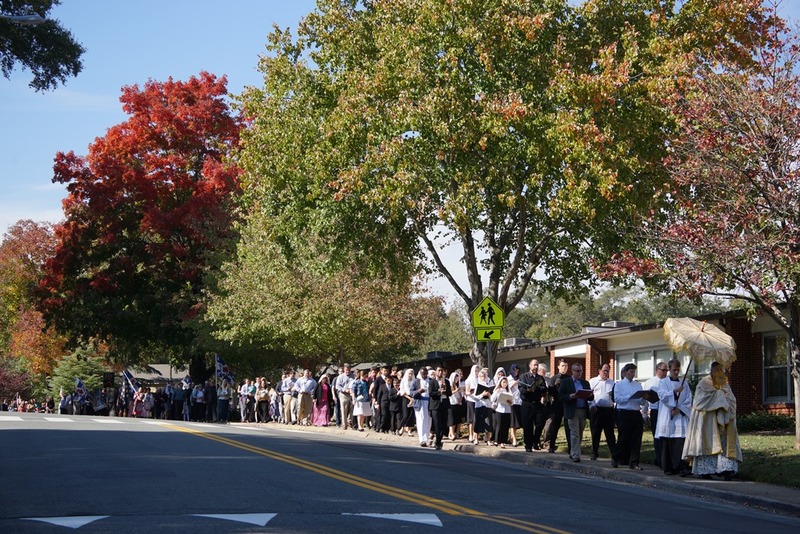 Although its several weeks away, we are pleased to announce Father has agreed to host the 2nd annual Feast of Christ the King Eucharistic Procession on Sunday October 29th after the 12:30pm Latin Mass at St. Ann. Weather permitting we will process outside around the parish after Latin Mass. As you may recall, in the traditional calendar, the feast of Christ the King falls on the last Sunday in October, and Eucharistic processions were common on this feast day shortly after its inception in 1925. The feast is the celebration of an important Catholic doctrine which emphasizes Christ’s kingship over each nation, and how each nation (and city) must explicitly acknowledge Christ’s kingship and his teachings (See Quas Primas encyclical). We’re inviting Bishop Athanasius Schneider to speak on this topic a few days prior (Oct 26) to help prepare us for this important feast day. Invite your favorite royal saints to join us! Saints like St. Louis IX, St. Isabel of Portugal, St. Fernando of Spain, Blessed Karl of Austria, St. Vladimir of Russia/Ukraine, St. Thomas More, etc.. (Canonized, beatified, or Servant of God). The Mexican Cristeros and Vendee martyrs are also included as they proclaimed Christ’s Kingship to their martyrdom. Catholic national/regional flags are also encouraged (like the Sacred Heart flag of Quebec, Kingdom of Jerusalem, or the Cristeros flag). Below is a list of royal saints for your benefit. This year we’re particularly interested in having people bring more flags and banners. You can search online to find them. This ebay seller in France (http://stores.ebay.com/sarl-toutimport/) seems to have a good selection but there are other places. Alternatively, it might be easier to have certain rare flags printed locally using computer images of the coat of arms.